Mystery Woman in Drake’s Giant Family Portrait Tattoo is….His Mother! Back in August 2013, we shared with you all a very rare photo of Drake’s tattoos on his back, including a portrait of the late singer Aaliyah, Drake’s beloved uncle and grandmother, and a mystery woman who, oddly enough, looked a bit like Lisa Kudrow. Well, after some serious digging, we’ve finally solved the mystery of Drake’s back tattoo, and the woman featured in the ink is…his mom! That’s right, Mrs. Sandi Graham made the cut when Drake was deciding who to ink on his back, and the detailed portrait tattoo shows a younger version of the blonde, who is apparently the most important person in Drake’s life. After getting a back tattoo of Aaliyah (the late singer whom Drake has never met but is definitely obsessed with), the rapper revealed another portrait tattoo on his back in December 2012 – this time paying tribute to his late uncle, Steve, and grandmother, Evelyn Sher with a huge tat in the center of his back. We noticed though, that in pictures of Drake’s family portrait tattoo, there was another portrait tat on Drake’s back that was blurred out and unrecognizable. It wasn’t until August 2013, when a one-of-a-kind photo of all Drake’s back tattoos was revealed, that we spotted a clear image of the pretty blonde, who we now know is Drake’s mother, Sandi. Drake has quite a few tattoos inked across his body, but the rapper is careful to choose only tats associated with the most important people and places in his life. Drake and his mother obviously have a very close relationship, and the 26-year-old was recently quoted as saying, “My mother is an incredible woman. I talk about her a lot on [the album Nothing Was the Same]. She’s brought me to this point single-handedly…She’s the most important person in my life.” What about his dad though? Drake’s parents divorced when he was just five years old, and Sandi pretty much raised the singer on her own, while his dad, Dennis, spent time in jail on at least two separate occasions. Drake has since made peace with his father, but there’s no doubt that Drizzy is a mama’s boy. 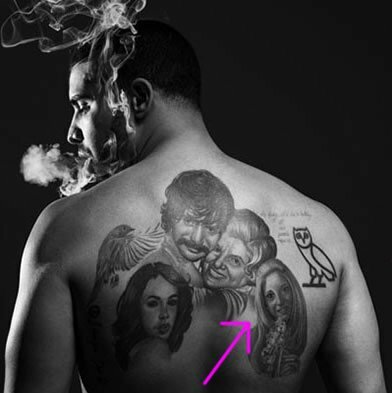 One Response to: Mystery Woman in Drake’s Giant Family Portrait Tattoo is….His Mother!